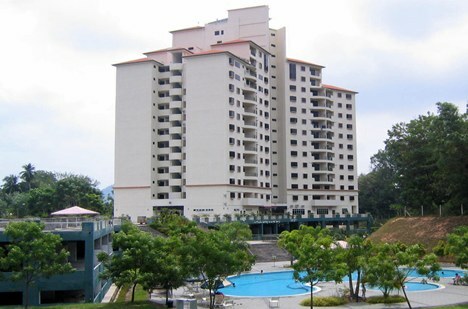 Lumut Valley Resort Condominium (LVRC) offers clean, secure, comfortable, affordable and yet flexible accomodation to travellers, either on business or vacations; and/or expatriates working in the vicinity of Lumut, Sitiawan, and Manjung District. Seventy five (75) units of air-conditioned furnished service apartments are available for rental either on daily, weekly, or monthly basis depending on your needs. LVRC is located aptly a mere 5 minutes walk away from the Lumut Jetty, which is a portal to Pangkor Island. Guests here are only 15-minutes away from enjoying the beauty of the island, with its cluster of fabulous islands and with unquestionably some of the best coves and beaches on the western coast of Peninsular Malaysia. Being 10 to 50 metres above the sea level, guests can enjoy a panoramic view of both the Dindings Channel and the Straits of Malacca in addition to the lush greenery of the Bukit Engku Busu Forest Reserve. The tourist town of Lumut, with its hospitable dwellers, idyllic surroundings and vibrant nightlife is also located nearby.